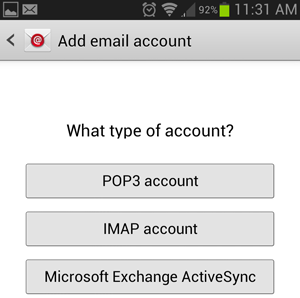 Follow the guide below to set up POP/IMAP email on an Android device. Step 1: Go to “Apps“. Step 2: Go to “Email”. Step 3: Click on the “Menu” button. Step 4: Go to “Settings“. 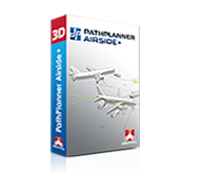 Step 5: Click on “+“. 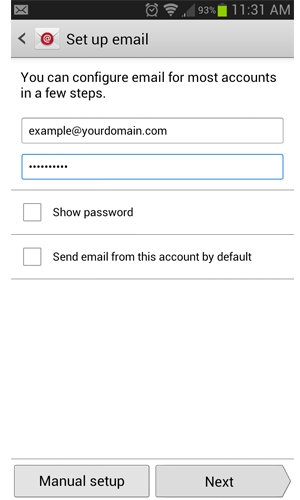 Step 6: Enter your full email address and password for the email account. The description field can be filled in as you see fit. Step 7: After hitting “next” select IMAP protocol. Step 8:Enter in our mail server information. For IMAP server enter mail.yourdomain.com and for username enter your full email address. 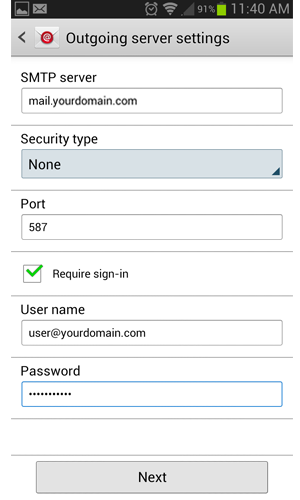 Example “user@yourdomain.com”. If the password field is not filled in, re-enter it again. 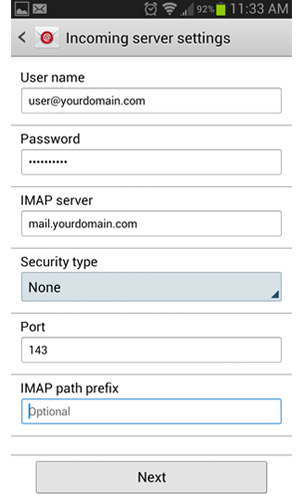 Select Port 143 for inbound IMAP port. Select security type to "None"
Step 10: Proceed to the following steps on screen.